What a crazy-busy week this was. Seems like every day something was due. But it's almost all over. Early on in the week I noticed a neat quote somewhere. It is: "Linux: be root. Windows: reboot." This is now firmly stapled to my cubicle wall. Saturday I attended Open Source Weekend. Learned some more cool features of Eclipse, some introductory material to mono, what the deal behind GPG is, and I gave a talk about open-source software in education with Professor Nash of University of Ottawa. In this talk, I showed off the PHP version of e-Tutor; the response was very positive. Today is my birthday. Bought myself some new headphones. I convinced my parents that it would be really great to have a new suit, and so I got one, complete with taupe shirt, a pretty cool tie, and the perfect belt to top it off. The ensemble looks great. The weather was amazing today, so I took the snow tires off the vehicle. The agenda for the next few months includes touching up some rusted areas, finding a leak in the door seal, and fixing what is most likely a cracked coolant pipe. Also, I intend to purchase some alloy Mazda Protege GT wheels to replace the current steel ones. These will have to have new tires. This is a good thing. With any luck, this ten-year-old car will have another ten years left; is it possible? 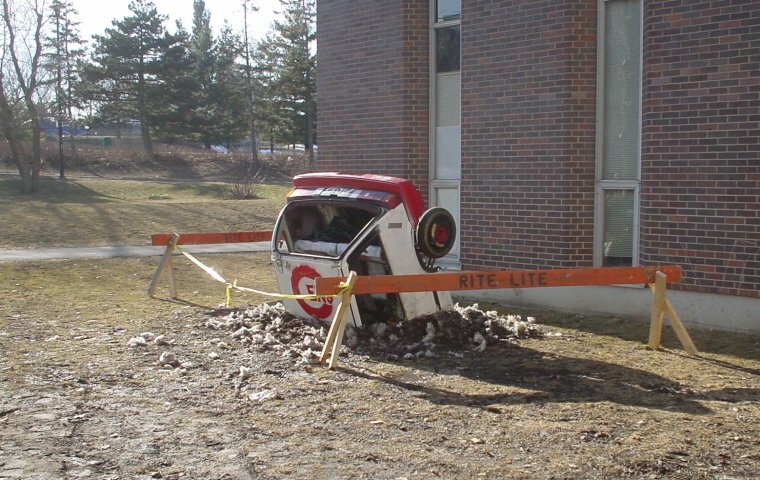 Last week included the most interesting prank I've seen in my three years at Carleton: a car made to look as though it had plowed into the ground after falling four storeys. The effect was really good, I was fooled at first. The car was actually cut in half during frosh week. The guy who owns it lives in attached housing and is entitled to a parking spot for his car, only he doesn't have a car; he has half of one. People's reactions could not have been better, especially seeing as it was on the day high school students came to see the campus. Yesterday marked the last lab and last test of the school year. Exams are quickly approaching. The day every aspect of the semester is over is the day I shall be happy. Yesterday, I also learned an important lesson. After taking down a full Guinness in haste, never, ever sprint for the train. It left me feeling very sick, unable to breathe. Physical activity is fine with other beers, just not Guinness. It was a busy week. I spent all week at school doing EngFrosh interviews. At the end of it all, there was a midterm Saturday morning. If there is one thing I do not like it's six day work weeks. And the midterm did not go particularly well. In more important and happy news, I've basically finished Celestia-GTK2 this weekend. The GConf stuff is all in, the Makefiles have been updated, a new icon has been created, pictured in all its SVG goodness. I feel the next version will be coming out soon, so timing seems to have worked out pretty well. I attended an informative presentation by Robert Love today (yesterday, it's just past midnight). After that, there was a good beer drinking event, when I really got to know the guy in a more one-to-one fashion. It's amazing how different-but-not-quite-different people turn out when you meet them in person. I don't get that a lot. I woke up this morning, ready to write about the first day of March being here. So much for keeping track of the leap years. Pictured is the passenger side of my car, after a certain individual in the household decided to not look where they were turning. A nice 5mm dent, some paint scratched right to the metal, a slight waviness to the door metal, and some frayed plastic weather-striping, three quarters of the length down the door. Yey. 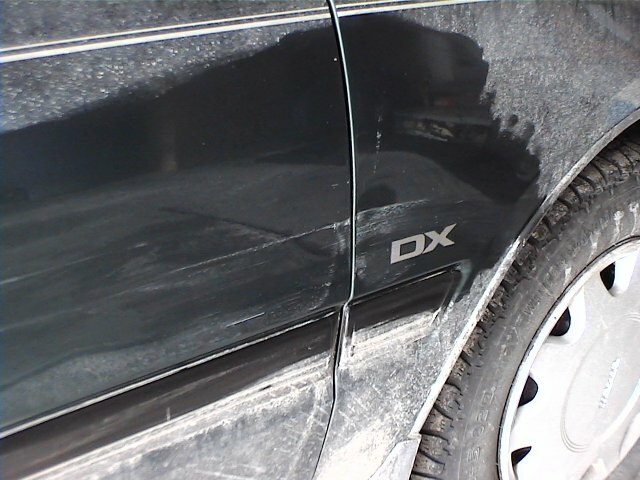 The DX decal will probably have to go with the fix, which is sure to carry a hefty price.